Our monthly analysis focusses on Google News. 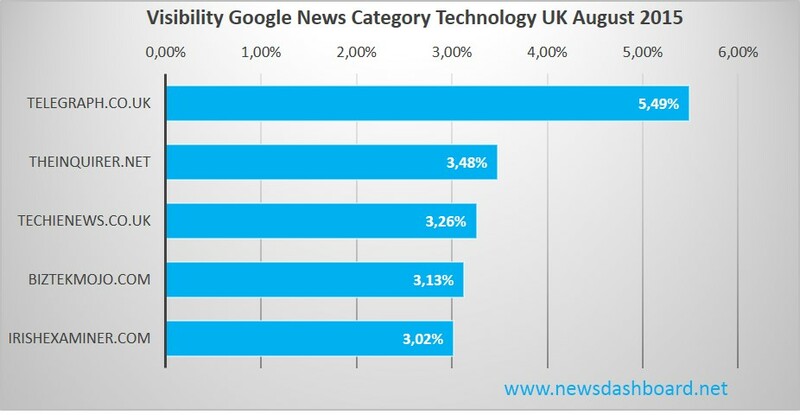 Apart from looking at the general Google News Visibility in the UK for August, we will observe two Google News categories in detail this month: “science” and “technology”. Without giving away the detailed results, it is very interesting to look at the publishers who dominate on an overall level. In single categories though, those publishers face challenges from specific “niche players”; in some cases they even get beaten by them. However, first of all we’ll see who is in the lead concerning Google News Visibility, and which positions are contested for. 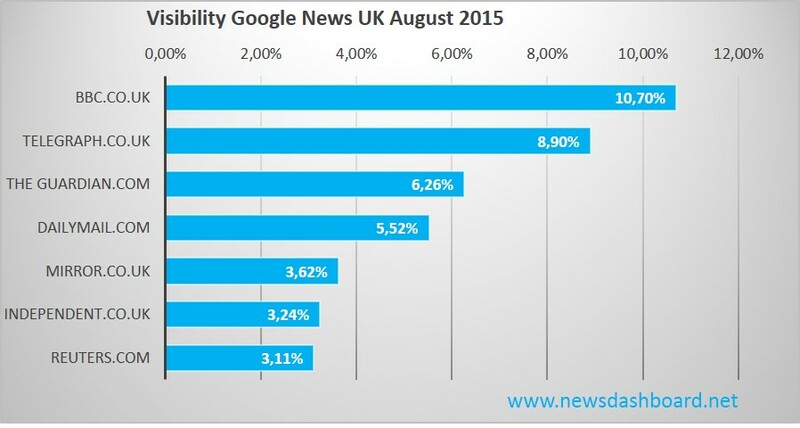 In August, just like the previous month, the BBC leads the field, and again, more than 10,7% of articles in the Google News ranking are the leaders’. The runner-up, and this being the Telegraph is no surprise, was able to push its visibility to nearly 9%. The Guardian only just made it onto the winner’s podium with 6,26%, which places them before the Daily Mail. So there is only one position left in the Top 5. Last month, The Independent was able to make it there with 3,26%. In August, they had 3,24%, but got beaten to 3,62% by The Mirror and therefore became 6th. The Mirror and The Guardian had the biggest increase of the current Top 5 compared to last month. Reuters’ performance is worth mentioning here: currently 7th, the agencies’ news performance not only moved up one position, but it also grew on a percentage basis from July to August. Now to the promised analysis in the Google News categories “science” and “technology”. Who are the respective Top 5 players, and where are the Top 5 of the general Google News Visibility? Let’s start with the category “science”. The DailyMail leads the ranking with 5,05%, although Compound Semiconducter nearly contest with 5%. The Mirror comes 3rd with 4,72%, closely followed by the BBC with 4,68%. The hullabaloo.com comes 5th with 4,53%. So, three of the strongest players of the average Google News Visibility also get a very good Google News Ranking in the “science” category. The other two publishers came as a surprise though. Let’s look at the category “technology”. Here, the Telegraph constantly keeps the pole position and comes first this month with 5,49% in the battle for Google News Traffic. The places after that are highly competed for, but 3,48% enabled The Inquirer to place itself before Techie News with 3,26%. Position number 4 goes to Biz Tech Mojo with 3,13%, and irishexaminer.com comes 5th with 3,02%. So in “technology”, even more than in “science”, most ranked publishers that do not belong to the “usual suspects”. This is totally different in the category “UK”, but this will be covered in a later analysis. It remains interesting to ask to which extent the results of the placed publishers are based on a systematic and comprehensive Google News Optimisation.